Can interior environments engage people in pleasurable and meaningful experiences and thereby have a positive influence on their happiness? This paper discusses why and how interior architects might want to consider implementing ideas in relation to ‘design for subjective well-being’. Despite of people being the ingredients that bring life to the built environment, it tends to be designed in such a way for them to predominantly only passively absorb the surrounding. Up to date, when designing interior environments, (interior) architects are mainly concerned about the fulfillment of various rather objective considerations. Typical reflections in this respect are: is there enough daylight, how are the acoustics, how is the accessibility and the organization of the inner space? Starting from such premises, the atmosphere of the inner space is given substance. However, empirical studies have shown that long-term happiness is less a matter of one’s circumstances than of the activities that a person engages in. Hence, one could go one step further from viewing the built environment as a static entity, to designing spaces that facilitate desirable activities. In other words, inner environments could aim to stimulate experiences that provide pleasure and meaning to its inhabitants. Subjective well-being (SWB) is an emerging research topic in the field of design sciences. Design models and strategies are being developed in an effort to increase users’ well-being. However, a detailed understanding of how these insights apply to interior architecture still needs to be refined. For this reason, this paper will firstly outline why interior environments could have the potential to contribute to people’s SWB and thereby to become platforms for the full spectrum of human well-being. The second section of the paper reflects on how a deliberate focus on SWB will affect the process of designing interior environments. The Positive Design Framework, developed by Desmet & Pohlmeyer (2013), will be introduced to the (interior) architectural community. Interior architects can use this framework as a guide to assist them in the design process of interior environments that aim to contribute to people’s happiness. A number of examples will demonstrate in an interior architectural vocabulary the value that this framework can have for this discipline. Abercrombie, S., 1990. A philosophy of interior design. Oxford: Westview Press. Alexander, C., Ishikawa, S., Silverstein, M., Jacobson, M., Fiksdahl-Ding, I. & Angel, S., 1977. A pattern language. Towns – Buildings – Construction. New York: Oxford University Press. Bluyssen, P., 2014. The healthy indoor environment: how to assess occupants’ wellbeing in buildings. New York: Routledge. Brunstein, J.C., 1993, “Personal Goals and Subjective Well-Being: A Longitudinal Study”, Journal of Personality and Social Psychology, vol. 65, no. 5, pp. 1061-1070. Constanza, R., Fisher, B., Ali, S., Beer, C., Bond, L., Boumans, R., Danigelis, N., Dickinson, J., Elliott, C., Farley, J., Elliott Gayer, D., MacDonald Glenn, L., Hudspeth, T., Mahoney, D., McCahill, L., McIntosh, B., Reed, B., Turab Rizvi, S., Rizzo, D., Simpatico, T. & Snapp, R., 2007, “Quality of life: an approach integrating opportunities, human needs, and subjective well-being”, Ecological Economics, vol. 61, no. 2-3, pp. 267-276. De Botton, A., 2006. De architectuur van het geluk. Amsterdam: Atlas. Desmet, P.M.A. & Pohlmeyer, A.E., 2013, “Positive Design: an introduction to design for subjective well-being”, International Journal of Design, vol. 7, no. 3, pp. 5-19. Diener, E., 2000, “Subjective well-being: The science of happiness and a proposal for a national index”, American Psychologist, vol. 55, pp. 56–67. Edwards, C., 2011. Interior Design. A critical introduction. Oxford: Berg Publishers. Fleming, J., Honour, H. & Pevsner, N., 1999. Dictionary of architecture & landscape architecture. London: Penguin reference. Galinha, I. & Pais-Ribeiro, J., 2011, “Cognitive, affective and contextual predictors of subjective wellbeing”, International Journal of Wellbeing, vol. 2, no. 1, pp. 34-53. Herssens, J., 2011. Designing Architecture for More. A framework of haptic design parameters with the experience of people born blind. Ph.D. Hasselt and Leuven: PHL University College / Hasselt University and Katholieke Universiteit Leuven. Hillen, B., 2014. The stages of life from beginning to end… Reallocation of the old retirement home at Hoogstraten to a care center with focus on palliative care. Master thesis and master design project. Hasselt: Hasselt University. Huppert, F.A. & So, T.T.C, 2013, “Flourishing Across Europe: Application of a New Conceptual Framework for Defining Well-Being”, Social Indicator Research, vol. 110, pp. 837–861. Klingmann, A., 2007. Brandscapes. Architecture in the Experience Economy. Cambridge: the MIT Press. Kopec, D., 2006. Environmental psychology for design. New York: Fairchild Publications. Lee, J., Je, H. & Byun, J., 2011, “Well-being index of super tall residential buildings in Korea”, Building and Environment, vol. 46, pp. 1184-1194. Lyubomirsky, S., 2007. The how of happiness: A new approach to getting the life you want. New York, NY: Penguin Books. Lyubomirsky, S., Sheldon, K. M. & Schkade, D., 2005, “Pursuing happiness: The architecture of sustainable change”, Review of General Psychology, vol. 9, no. 2, pp. 111-131. Manzo, L.C., 2003, “Beyond house and haven: toward a revisioning of emotional relationships with places”, Journal of Environmental Psychology, vol. 23, pp. 47-61. Ostroff, E. Universal Design: the new paradigm. In: W.F.E. Preiser and E. Ostroff ed. 2001. Universal Design Handbook (pp. 1.3 – 1.12), New York: McGraw Hill Professional. Petermans, A., 2012. Retail design in the experience economy: conceptualizing and ‘measuring’ customer experiences in retail environments. Ph.D. Hasselt, Belgium: Hasselt University Press. Petermans, A., Janssens, W. & Van Cleempoel, K., 2013, “A holistic framework for conceptualizing customer experiences in retail environments”, International Journal of Design, vol. 7, no. 2, pp. 1-18. Peterson, C. & Seligman, M.E.P., 2004. Character strengths and virtues: A handbook and classification. Oxford, UK: Oxford University Press. Plevoets, B., 2014. Retail-Reuse: an interior view on adaptive reuse of buildings. Ph.D. Hasselt, Belgium: Hasselt University Press. Pohlmeyer, A.E., 2012, “Design for Happiness”, Interfaces, 92, pp. 8-11. Ryff, C.D., 1989, "Happiness is everything, or is it? Explorations on the meaning of psychological well-being", Journal of Personality and Social Psychology, vol. 57, no. 6, pp. 1069–1081. Seamon, D., Physical and virtual environments: meaning of place and space. In B. Schell, G. Gillen and M. Scaffa Eds. 2013. Willard & Spackman’s Occupational Therapy. 12th edition (pp. 202-214). Philadelphia: Wippincott, Williams & Wilkens. Seligman, M.E.P., 2011. Flourish. New York: Free Press. Sheldon, K. M., & Lyubomirsky, S., 2006, “Achieving sustainable gains in happiness: Change your actions, not your circumstances”, Journal of Happiness Studies, vol. 7, no. 1, pp. 55-86. 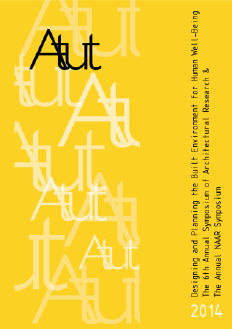 Smith, D., Metcalfe, P. & Lommerse, M., 2012, “Interior architecture as an agent for wellbeing”, Journal of the HEIA, vol. 19, no. 3, pp. 2-9. Ulrich, R., 1984, “View through a window may influence recovery from surgery”, Science, vol. 224, pp. 420-421. Ulrich, R., 1991, “Effects of interior design on wellness: theory and recent scientific research”, Journal of Healthcare Interior Design, vol. 3, pp. 97-109. UZ Brussel, 2013. UZ Brussel zamelt geld in voor bouw van Villa Samson voor patiënten met huisdieren. Available through: http://www.uzbrussel.be/u/view/nl/7460044-UZ+Brussel+zamelt+geld+in+voor+de+bouw+van+Villa+Samson,+een+huis+voor+patienten+met+huisdieren.html [Accessed 30 September 2014]. Vaikla-Poldma, T., 2003. An investigation of learning and teaching processes in an interior design class: an interpretive and contextual inquiry. Ph.D. Montreal, Canada: McGill University. Veenhoven, R. Greater happiness for a greater number. Is that possible? If so, how? In: K. Sheldon, T. Kashdan and M. Steger Eds. 2011. Designing positive psychology: taking stock and moving forward (pp. 396-409). Oxford: Oxford University Press.